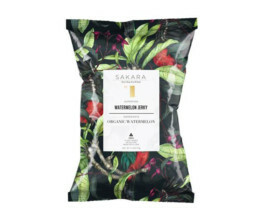 It was love at first bite when we discovered watermelon jerky from Sakara Life, and we’re dying over Pressed Juicery‘s newest seasonal flavor – a flawless melon and cherry combo we’re adding to everything from hydrating cocktails (stay tuned!) to vitamin-rich homemade popsicles. Read up on the superfood status of our most-loved melon here and look below for more ways to max out on our fruity fixation, including a sweet salad recipe from green-eats goddess Candice Kumai. What are your favorite ways to watermelon? Let us know in the comments! 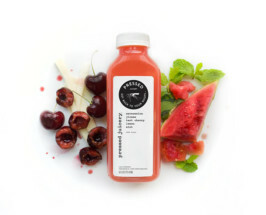 Watermelon, Cherry + Jicama Juice | We can’t stop sipping this refreshing new flavor blend from Pressed Juicery. Antioxidant-rich cherries and uber-hydrating watermelon juice create a summery fruit salad flavor experience we can guzzle on the go. Watermelon Jerky | Summer is about simple pleasures, like this Watermelon Jerky from luxe clean meal delivery service, Sakara Life. Offering all the benefits of watermelon minus the watery bulk, this snack is the ultimate for hiking, beaching and managing midday office hangriness. 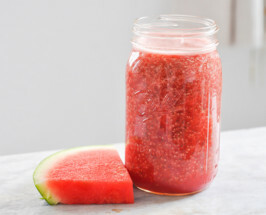 Watermelon Chia Elixir | Hydrating skin-saver or healthiest summer cocktail base ever? How about both! This easy blend is an absolutely delicious way to sip down some watermelon while loading up on protein from super-powered chia seeds. Share the post "Watermelon Jerky + 3 Ways To Binge On Our Fave Fruit"